Originally, I only purchased tickets for Dad and I to go to Mickey's Very Merry Christmas Party, but a few days later Mik decided he wanted to try it out since Mom was with us this trip and the ticket includes theme park admission (she does not have an annual pass like the rest of us). He figured if he got tired of it, they could at least leave. He also remembered enjoying the Halloween party we did a few years ago at Disneyland and thought this would be fun like that, although slightly different. Since you can get in a few hours before the party starts, we killed some time going on Jingle Cruise and shopping in the Christmas store in Liberty Square. We then got in line to buy the special pins only available during the party. Not as bad as shopping at D23 Expo, but poor location with the traffic flow of the pin store in Frontierland being forced in the accessible entrance and then your stuck exiting the other way, which is not entirely a big deal, but then everyone was already starting to crowd it getting ready for parade. We decided to just quickly grab a spot one row back from the front to at least enjoy the parade. Mom then went back and forth several times getting us all some of the free cookies and cocoa they give out during the party. 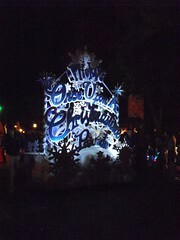 The parade was overall enjoyable, although the princess float broke down causing a long delay in the parade. Mik was tired of everything by then, especially since it ended up being actually more crowded than when we have normally been in the Magic Kingdom. Thus, we quickly went and got the special Sorcerer of the Magic Kingdom card for the party for each of us and then Mom took him back to the truck to wait. Dad and I stayed to watch the show on the castle (totally awesome, especially with our Glow with the Show ears from Disneyland now working here, although we got stuck in a spot just off Main Street and it did not always sync with show). 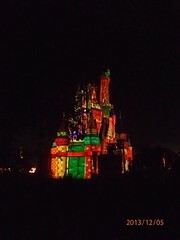 We also saw the fireworks and the show in front of castle before quickly backtracking to Frontierland to buy a peppermint brownie before the second parade started and then grab some cookies and cocoa on our way out. 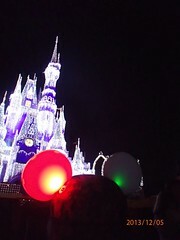 Overall the entertainment that goes with Mickey's Very Merry Christmas Party was an enjoyable holiday thing to experience. However, we expected it to feel more like the Disneyland Halloween party in terms of crowds. 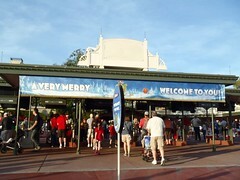 Instead it felt very crowded and actually more so than most times we are in the park during normal hours. I guess that could have to do with it being sold out that night and maybe the Halloween one was not when we did it, but still Disneyland seems to take less people to feel crowded. It was worth experiencing at least once, especially since I really wanted this year's Sorcerer card with Scrooge's nephews, but not sure we would do it again and if we did we certainly would only get tickets for Dad and me. Mom and Mik would have more fun and almost spent less money if they had instead gone to the Fork & Dine at the AMC in Downtown Disney. The Jungle Cruise is one of the wheelchair accessible rides at the Magic Kingdom. We usually skip it because Mik is not too into it, but since they do not have our favorite holiday ride (it's a small world) or any other holiday themed ride (Haunted Mansion Holiday) like Disneyland does we decided we had to try it out as the Jingle Cruise. 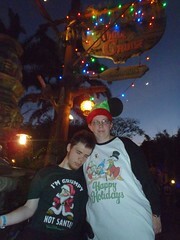 Plus, this trip Mom actually came with for the Mickey's Very Merry Christmas Party and Jungle Cruise is her favorite attraction. Overall I was kind of disappointed in the Jingle Cruise, as I was expecting to see a lot of holiday decorations, but it mainly is just Trader Sam at the end decorated. The main holiday theme is the corny jokes the skipper's tell, which make it a nice different experience than normal, but I am not into that thing in the first place. Mom loved it, though. 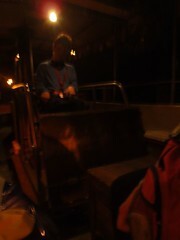 Mik likes the way the wheelchair gets lowered onto the Jungle Cruise boat (the holiday name for the accessible one is Brrrrr Bertha). What we did not like, though, is that the disability guide for the Magic Kingdom does not say there is a special mobility access for this ride, but when we tried to get in the regular line we were directed to get a Return Time card to come back instead of wait in the line. Yeah, it is nice we could go do something else and the wait time ends up being the same, but we missed out on the whole queue experience, which I think also meant missing out on most of the holiday decoration aspect of the Jingle Cruise. Also, we should have planned better and gone in the daylight, as there is not special holiday lighting (or even much regular lighting) to make the ride more interesting after dark and you can see much more of the attraction in the daylight.